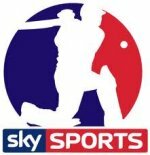 We are delighted to announce that the club has re-installed Sky in the clubhouse for the remainder of the season. The committee recognised that despite the high costs, it was an important investment to make and took advantage of an ECB deal to set it up. We hope that this will encourage people to use the facilities and stick around after games, especially given that it is an Ashes year. In order to help out the running costs we will be putting 'Sky Fund' jars on the bar and hope that people will find ways to contribute to them over the coming months, for example the 1st XI have been contributing to it whenever they drop catches this year. Finally an early warning that Saturday 3 August will be our nominated ECB Ashes Open Day. This is a day specifically designed to showcase our club to potential new members, volunteers and sponsors by opening up our club to the public and inviting them in to watch the cricket on and off the pitch. Matt Lock will be sending out more details about this as it gets closer, but please put this date in your diary now. We look forward to seeing you all enjoying Sky Sports Champions League Final coverage in the bar on Saturday during the Nationalities party. Inaugural ECAD Match a Success! On Sunday 12 May Woking and Horsell CC hosted the English Cricket Association for the Deaf (ECAD) South East XI. The match included a selection of the South East of England’s best cricketers with hearing impairment and was a tightly contested and highly enjoyable match for both the players and the large crowd in attendance. The game was aimed to be the first step in an on-going relationship between the club and the ECAD South East side, with more games hoped to take place next year. Despite the constant threat of inclement weather cutting the game short, the cricket on display was brighter than the conditions, with ECAD South East opting to bat first and clocking up an impressive total of 220 in their allotted 40 overs. Allison, Baker and Lycett racked up the runs at a pace only checked by the fall of a clutch of late wickets. Read more: Inaugural ECAD Match a Success! 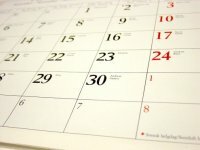 Fixtures for 2013 are now up. You can view these by selecting the relevant team from the fixtures section of the menu above. The 1st through to the 4th XI Saturday league team fixtures are set by the Surrey Championship. 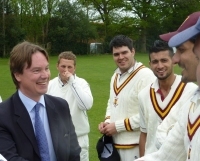 The 5th XI is set by the Surrey County League and all Sunday matches are friendlies. All fixtures are also in our club's Google calendar which can be accessed here. If you use Google calendar you can share these with your own calendar by using the + button in the lower right. If you have any questions regarding the fixtures please contact our fixture secretary Ramesh Parthasarathy. 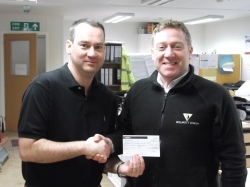 Peter Smith, WHCC Club Chairman, recently collected a cheque for £290 from Neil Fox, Senior Building Manager at Willmott Dixon. Willmott Dixon are currently constructing WWF UK Living Planet development in Brewery Road, and in August last year staged a charity cricket match at Brewery Road. The match brought together staff from Willmott Dixon, WWF and several sub-contractors. The cricket club were also represented in what was a real community event. Integration into the community is a key aim for Willmott Dixon, as it is for WHCC and we have every intention of a repeat event for 2013. Thank you to all involved and in particular to Neil and his team for the generous donation. Spring may not be quite in the air just yet but the season will be underway before you know it, so why not get ahead of the game and pay your subs now? We’ve made life easy for you with senior rates being held at the same level for the 5th year in a row and the application process also remains unchanged. Most members took advantage of paying and completing their application online last year so this is something we shall repeat for the forthcoming season. Read the club's Code of Conduct, which applies to all members and all players. Go to the membership section of the website and follow the link to the online membership form. This must be submitted to validate your membership. Transfer your membership fee to the club’s bank account (contact the Membership Secretary for details). Please put your name in any reference field. We’re still happy to receive the paper membership form (return address included) and a cheque via post if you’d prefer. You can also hand these personally to the Membership Secretary, Nick Tune, or your captain. Please do make every effort to pay your subs on time as this does assist the running of the club and based upon the continued strength of membership, we do expect to show selection preference to paid up members from June onwards. Hopefully that’s all self-explanatory but please contact Nick Tune if you have any questions.